So, you’re in Japan for a while, and of course you want to see the country? Most people immediately think Shinkansen – the bullet train. The bullet train is great, it’s fast, convenient and simple. Also great if you have a JR Pass. Buy without the railpass, it is expensive, and many young travellers are on a budget. So what about some alternatives? Often time, domestic flights are cheaper than the bullet train. For example, taking a flight from Osaka to Tokyo is cheaper by air, just be sure to book in advance. If you have enough time in your hands, you can get anywhere by local trains. Looking at my trip for Hiroshima tomorrow, local trains, despite taking 5 hours longer, is half the price, and often allows you to see more of Japan’s beautiful scenery. There are many private coach companies in Japan, and taking an overnight is the cheapest. It also saves on accommodation for one night. I personally use Willer Express. They offer a deal to customers outside of Japan (as in book outside of Japan), of 3 non-consecutive journeys for a very low price. An amazing website I found, called Hyperdia.com conveniently displays all of this information to you, all you need is to say when and where. It displays rail, air and coach all in one, giving you information on times, prices and where to change. You could easily use it to plan one journey from Hokkaido in the north to Kyushu in the South. Well, in a few days I will be getting my student loan through, and I will have enough money to do something worthwhile again and go travelling. Two years ago I spent a week in Hiroshima, doing the usual sightseeing, meeting new friends and the like. It was an incredibly fun week, and I met a lot of great people. I wish I had photos from Hiroshima, but that was part of the group of photos that did not get backed up online, and so when my laptop broke, I lost all of them. So, next weekend I have decided to go back to Hiroshima, see the city again, take lots of photos and try and find some old friends still in the city. I will be travelling by coach with Willer Express. It is by no means the fastest way to get to Hiroshima, but it is much cheaper than taking the bullet train. A round trip with Willer Express, from Umeda in Osaka to Hiroshima Station, costs about ￥8,000. Once in Hiroshima, I will be staying at J-Hoppers Hiroshima as I did last time. I stayed there before, and know it to be a nice place. 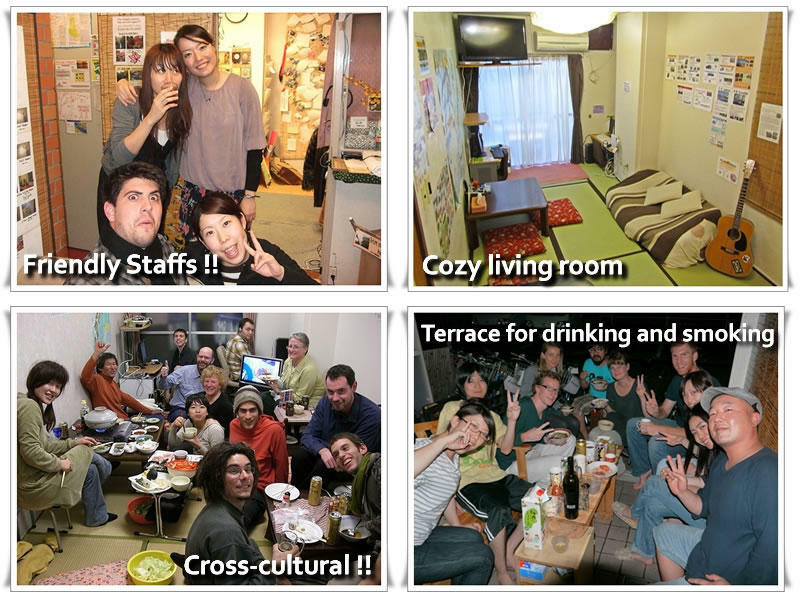 For a room in a dormitory, it will only cost you about ￥2,500 a night, so cheap as chips. So I’ve made my plans, and on Thursday I will book everything last minute (hopefully), and then I’m off, to the furthest from home I’ve been seen being in Japan! From the start of January this year, McDonald’s Japan has started selling a new series of burgers inspired by America in the past. Right now we have the “American Vintage ’50s” series, which will be followed by meals inspired from the ’70s, ’80s and ’90s. So last week, during a short break between my classes, I dropped into the local McDonald’s for a quick bite to eat. Seeing they had these new burgers being promoted, I thought I should give it a try, and I had high expectations, remembering the American series that we had back in England a couple of years ago. I picked the “Diner Double Beef (ダイナーダブルベーフ/daina daburu bi-fu)” set, the burger of which you can see on the left of the picture above. The “set” as they are called in Japan, or meal as we would call it, cost ￥770, which is of course the burger, a drink and a box of fries with cheese sauce and “bacon topping”. 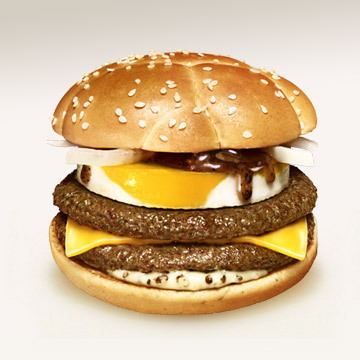 So not much more expensive that a usual set in McDonald’s Japan. Once I’d found a seat, I opened up the fries, and squirted on the “cheese”. It was not cheese. It was some plastic tasting, foul smelling imitation cheese, and the “bacon topping” did not help the flavour either. 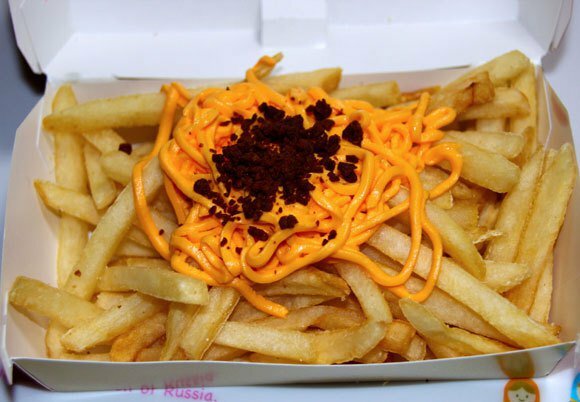 The idea is a brilliant one, cheese covered chips from McDonald’s, but the execution is terrible. From now on, I will be wary of anything in Japan called cheese, as well as “cheese” from any American company. It seems I am not the only one who didn’t enjoy the chips, as shown in this article by RocketNews24. The burger itself was average at best. Two beef burgers, a fried egg and onion, with a black pepper sauce. The burgers were pappy, the sauce has a strange chemical taste to it and the egg was tasteless. But the black pepper sauce at least gave it some flavour. It’s safe to say that I won’t be eating that particular burger again. However, I’ll still be keeping my eye out for the next in the series, especially as I’ve read in the past about tasty looking burgers coming out of McDonald’s Japan. When Bettina and I went to see the changing of the leaves in Kyoto. Two friends from England came out to see me and celebrate New Years. 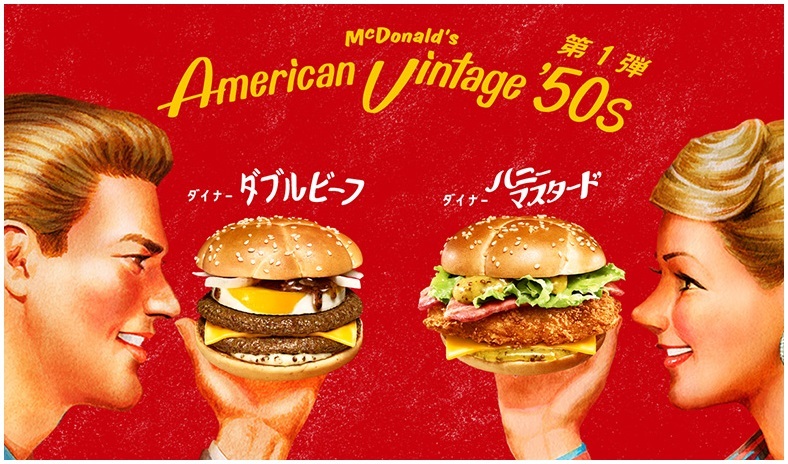 The first of McDonald’s Japan’s new nostalgic American series. Ah Sukiya. It’s cheap, it’s basic and it fills your stomach. Faster and cheaper than any western fastfood chain as well. The students saviour, open 24 hours a day all over the country. Anyone that has been to or is living in Japan will already know about this chain of restaurants. So this post is more for the people that don’t know. This is what I usually order. Chizudon to ontama. That first word literally means “cheese bowl”. 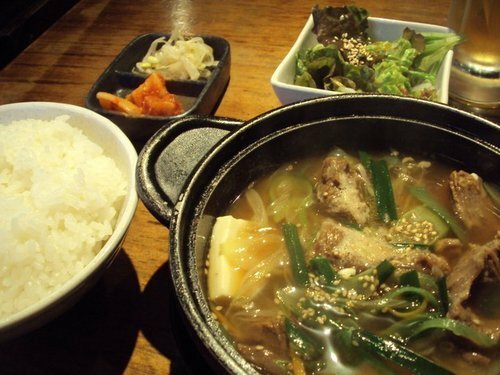 See Sukiya specialises in a bowl of rice, with some sort of meat topping, usually beef and onions. I get mine with cheese on top. 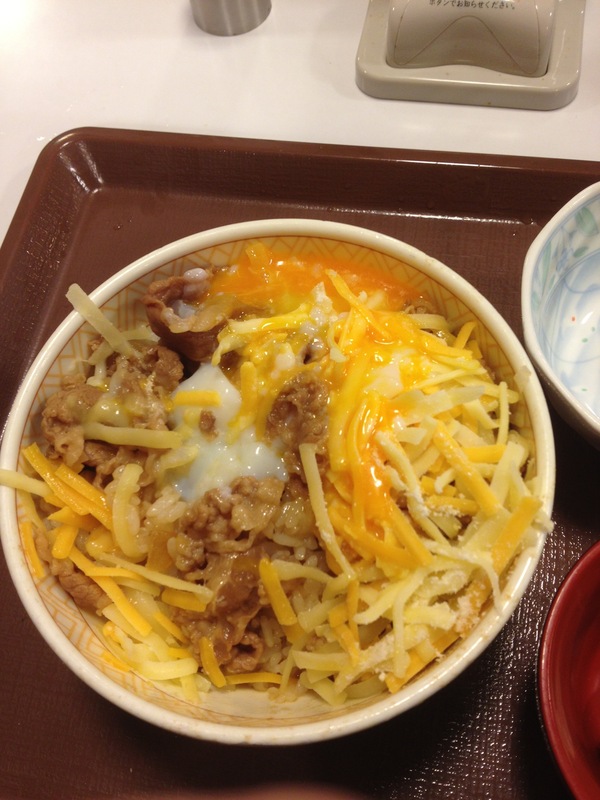 Ontama means a par-boiled egg, which I like to mix together, making a sloppy cheese, beef and onion on top of my rice. Many westerners may be put off of an egg that is only part cooked, but it is quite normal here, and perfectly safe to eat. In fact it is more common to see people mixing in raw eggs. Don’t knock it until you try it! So for this large bowl of rice, meat, cheese, onion and egg, what will it cost you? All of that is less than ¥500 (£3). Dirt cheap, easy, quick and healthy. If you’re in Japan and want something quick, check out your local Sukiya! This actually happened to me a couple of months ago. I told him I had no TV, and he said a quick succession of complicated words I didn’t understand. I told him again I have no TV. He understood, but I think he mainly gave up because I’m a foreigner that doesn’t understand formal Japanese. This one is from back in September, from a restaurant called Daikichi. It is exactly what it looks like: grilled chicken. 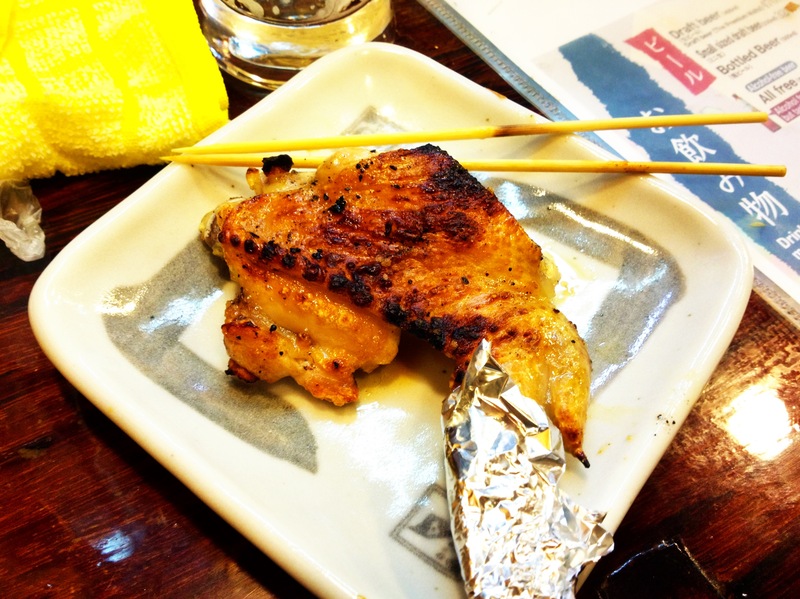 Grilled chicken, called yakitori in Japan, is incredibly popular here. This is of course just a simple chicken wing, but you can get all sorts of chicken, from breast, to skin, to heart and liver. My favourite is probably the heart, is has a very rich flavour. This one I wrote about a while ago. 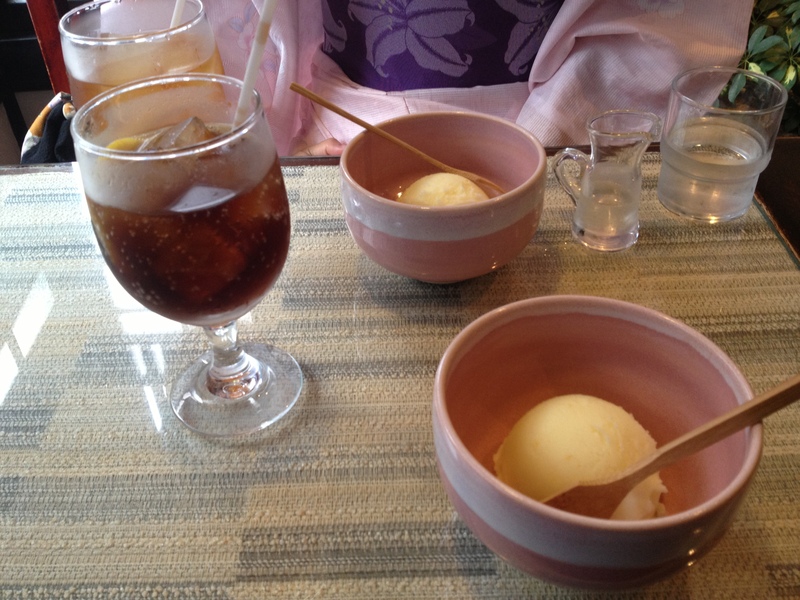 Very simple: orange sorbet and coca-cola. Seems like a very strange thing to have really, and not very Japanese. To read the full story, go here. This one is pretty cool. When two friends and I went to the Osaka Aquarium, we found this kind of restaurant. Imagine a place that, for about Y2000, gives you all you can eat for 90 minutes. Everything is on a big buffet. But, nothing is cooked. WHAT?! No, it’s not a sushi/sashimi place. As you can see in the picture above, you take the raw food to your table, cover it in batter and breadcrumbs, then deep-fry it in your own, private fryer. 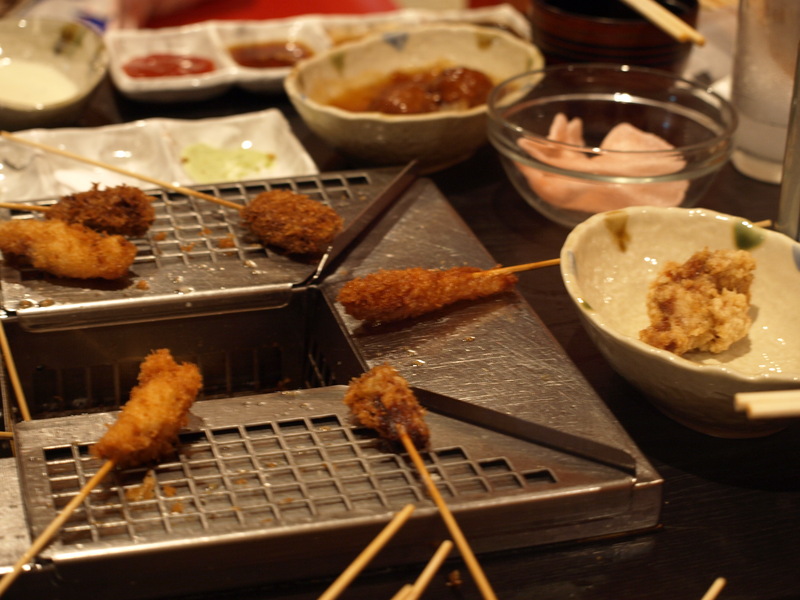 It tasted great, but after 4 or 5 plates of deep-fried meat and vegetables, the oil in your belly starts to build up! Still, if you’re in Japan and have done all the other big foods, don’t miss this one. 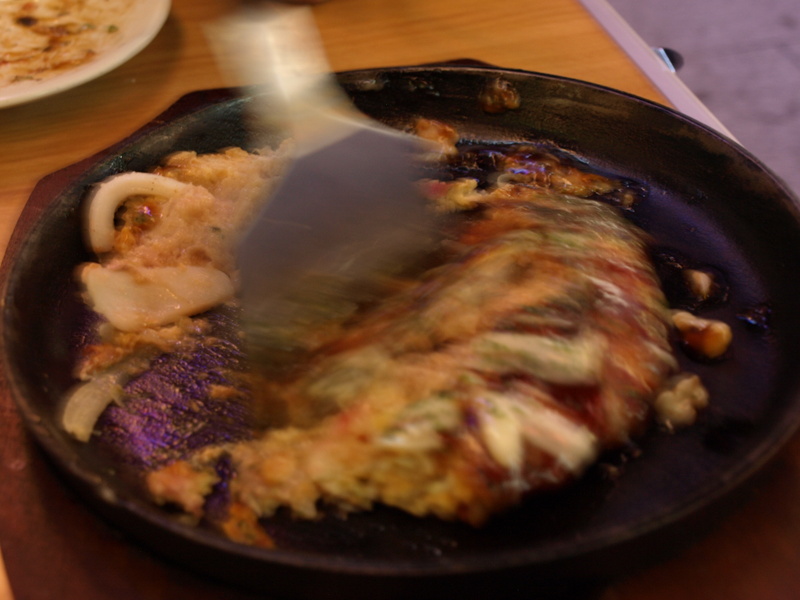 Kansai- or Osaka-style okonomiyaki is the predominant version of the dish, found throughout most of Japan. The batter is made of flour, grated nagaimo (a type of yam), water or dashi, eggs and shredded cabbage, and usually contains other ingredients such as green onion, meat (generally thin pork belly, often mistaken for bacon), octopus, squid, shrimp, vegetables, mochi or cheese. I’ve had these several times in Japan, and they’re always good. And so filling! In fact, just around the corner from my apartment is a pretty good okonomiyaki restaurant. (Sorry for the bad photo, this one was an “action shot” as I was so hungry at this point, I couldn’t wait”. Another DIY meal. Aaah, yakiniku. Literally “grilled meat”. At this place, like before, you pay for a set time, 90 minutes, and then its as much as you can eat. You can get vegetables and the like, but the main attraction is the meat. Unlimited beef, chicken, pork! As long as you finish it all. And you cook it on your own little flame grill like the one above! Cook it to your own personal taste, dip in a bit of sauce and you’re sorted! Yakisoba. I bet you can remember what yaki means by now, right? 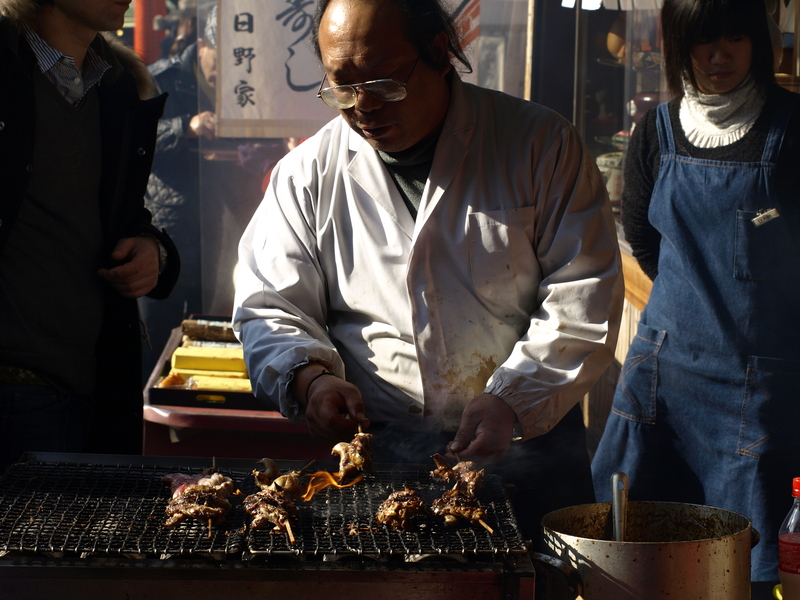 If not: yaki is grilled, and soba is the kind of noodle you can see above, made from buckwheat. 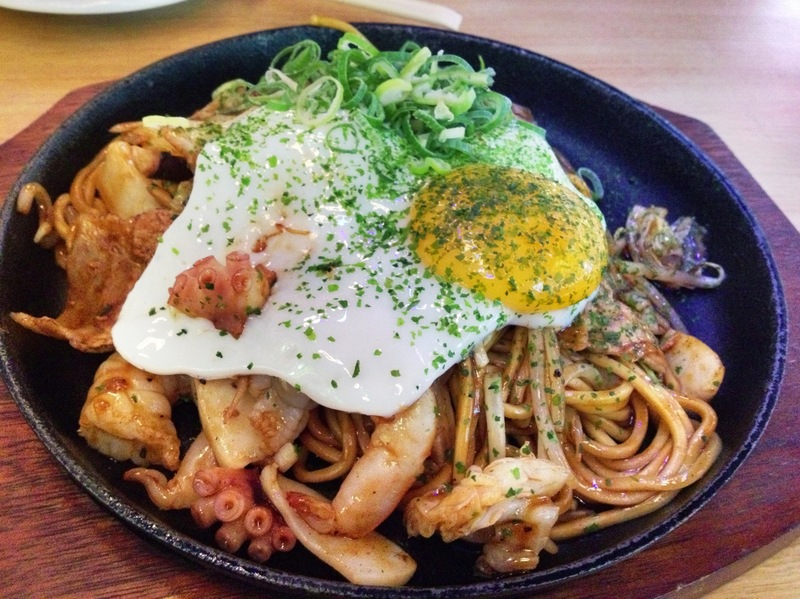 The one above is a mixed yakisoba, with egg, octopus, prawns, chicken, pork and cabbage. One of my favourite Japanese dishes, yet oh so simple! This one was bought at the same time as the okonomiyaki above. For the story of when we went to get these dishes, look here. Ramen. I’ve put these two together as they’re practically the same, just with slightly different sauce/soup. 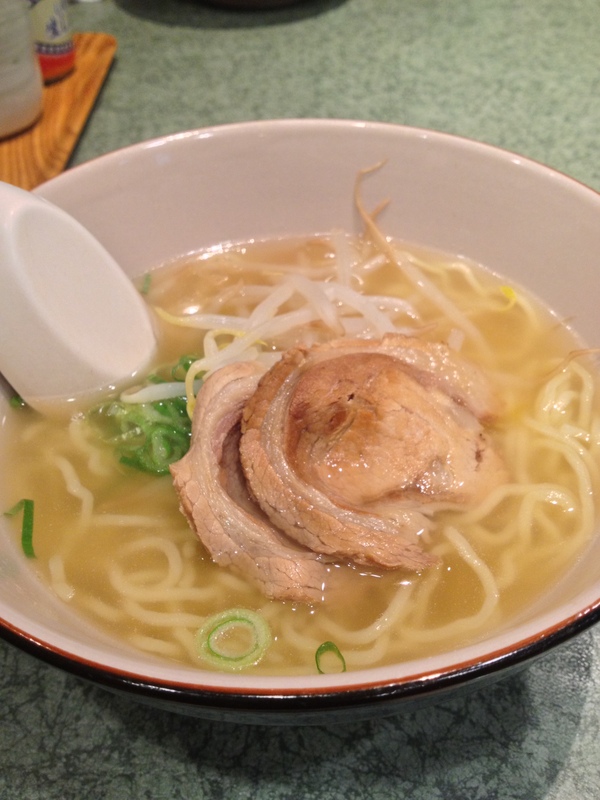 Ramen was originally a Chinese style of noodle, but now is more commonly associated with Japan. Every broke university student has eaten ramen at one point or another. But this is the proper way to eat them. The top is miso ramen, ramen with miso soup, mixed vegetables and pork. The bottom photo is shiyou ramen, or salt soup ramen. That doesn’t sound appetizing, but trust me, it is. It isn’t overpoweringly salty, yet brings out the flavours of the other ingredients. Sorry for the terrible photo on this one, I was struggling to keep this down. This thing here, I really didn’t like. I can’t remember it’s name, my friend (an English girl) ordered them. She loved them. 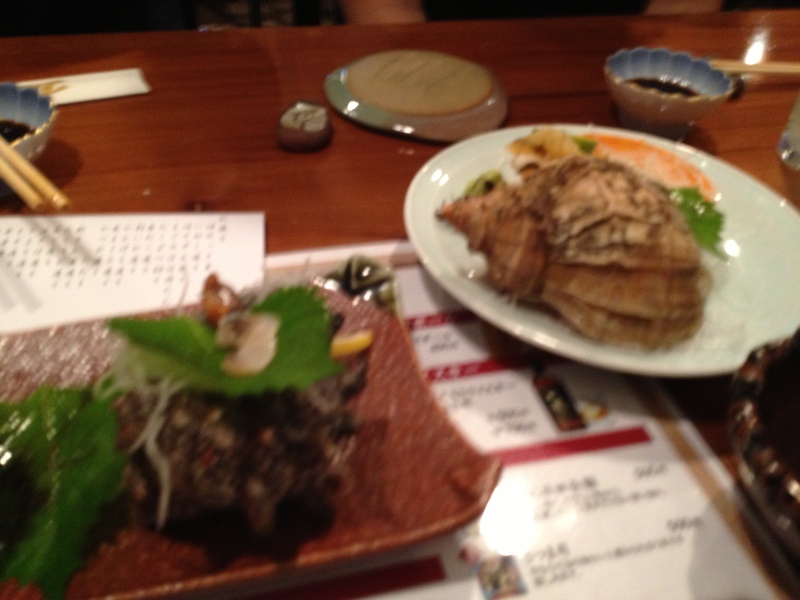 I am really really not a fan of raw, cold, slimy sea snails. Beer. It had to come in here somewhere. Now, I used to absolutely love Japanese beer. It is still good stuff. But after only drinking Japanese beer for 5 months, it’s getting boring. Anyway, not the point. This beer here is not a good beer, it’s just big and cheap. That there is bigger than my head, and costs Y280 (under £2). 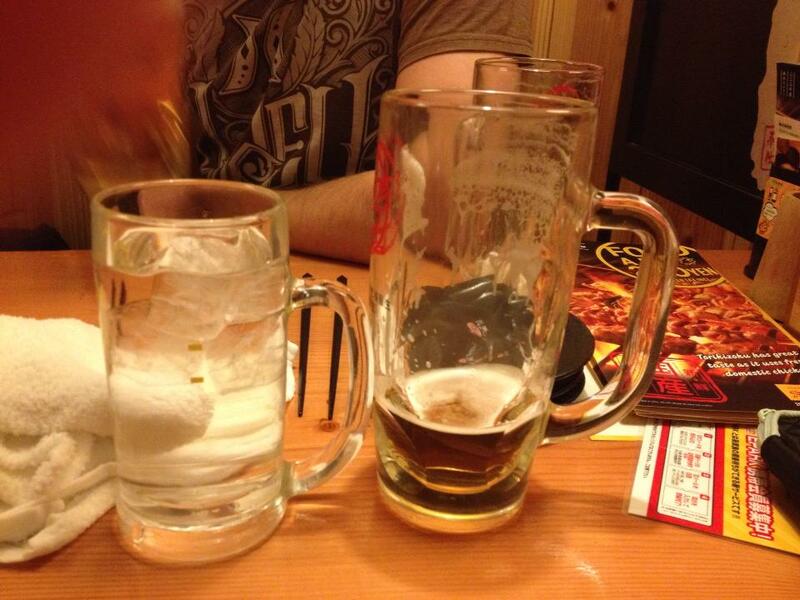 The glass on the left is a little under a pint. A much tastier beer is something from the Minoh brand, which has various different beers including Pilsner, IPA, Stout and Weissen. And that’s some of the food I’ve been eating so far. From this time on, I’m going to try much harder to remember to photograph my food, and write about it on here. If there is anything you think I should try, let me know! Sometime on that rainy Wednesday afternoon I arrived in Japan and made my way across Tokyo to my hostel, somewhere North of Ueno. I immediately trundled to the other other side of Tokyo and spent a couple of hours in Shibuya. Unfortunately, jet lag hit me pretty hard, and I was exhausted by 4:00 pm. So I went back across Tokyo. Again. 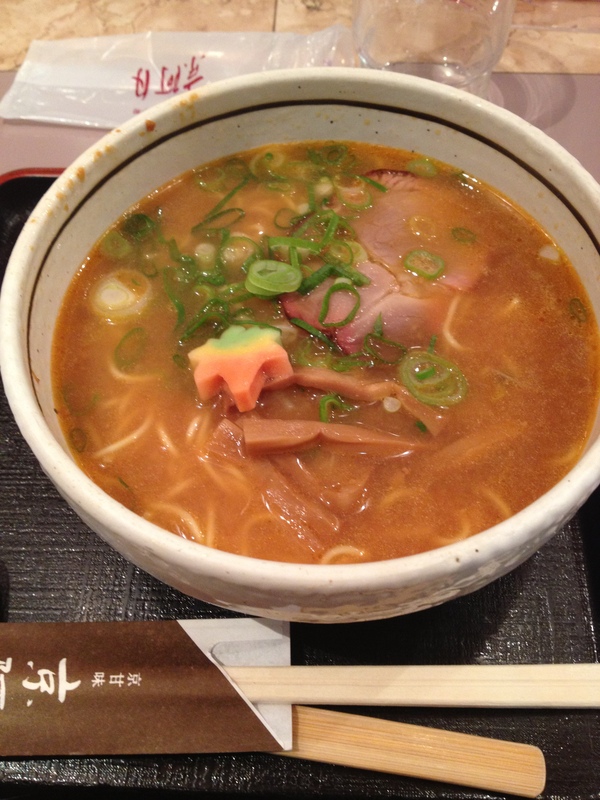 By the time I hit Ueno, I had gotten hungry, so I started to look for something to eat. Just outside the station, off of Showa Dori, I stumbled across a small, quiet restaurant. Not being able to speak or read Japanese at the time, I had no idea what kind of food it was. 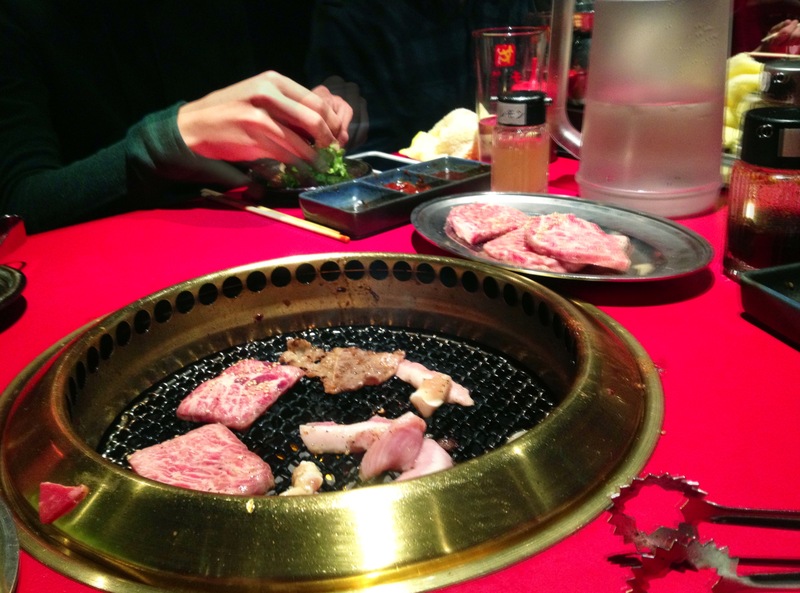 I know now that it was a yakiniku, or grilled meat, restaurant, where you get your own charcoal grill and cook your own meat. However, being oblivious to all of this, I ordered something off of the lunch menu that looked good, but still not entirely sure what it was. I literally pointed at the menu and smiled. A meal like that in England would set you back at least ￥2,000 to ￥3,000 (somewhere between £15 and £25, depending on where you go). I got all this, at lunch time in the center of Tokyo, for a mere ￥700 (£5-£6). Probably the best value meal I have ever had. The atmosphere, though quiet at the time, was nice and relaxing, away from the hustle and bustle of the busy streets outside. The food was absolutely delicious as well. And of course, who could complain with a price like that. 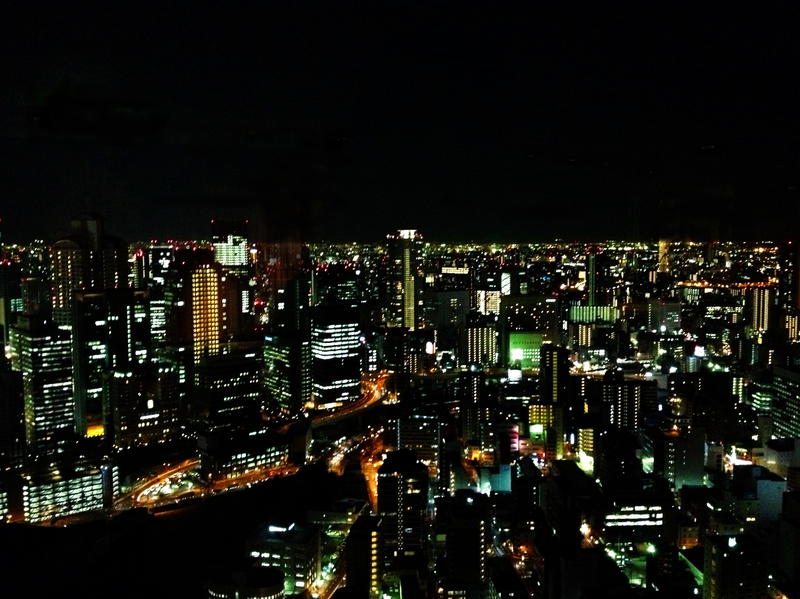 I liked the place so much that when I was in Tokyo again two months later, I took a friend there on my recommendation. And that’s the story of the first thing that I ever ate in Japan. And what a great start it was. I’ve got a quick one for you today, but something I want to write to start off my new “Food” section of this blog, something I’d intended to do for a while but I’ve never gotten around to it. Now, this isn’t something I ate, unfortunately, but it something I saw earlier in the week that I wish I had bought to eat! Near Fushimi Inari Taisha (Shrine) in South-East Kyoto, we walked past several stores with men standing outside with barbecues roaring. 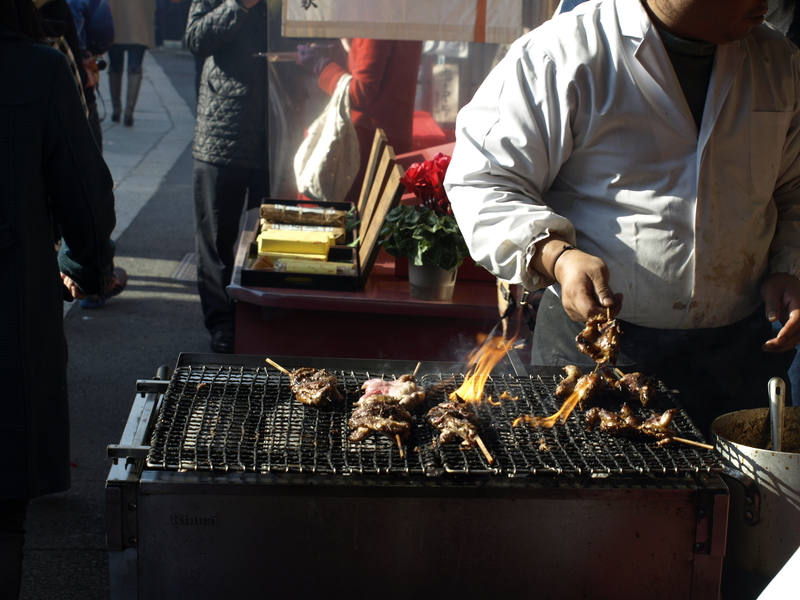 On each barbecue were several little quails, skewered onto kebab sticks, and were being flame grilled in the open air. Really basic but the smell was great. None of us stopped to by them for a few reasons, being in a rush, having already eaten, being very hungover and so on. Perhaps if I go back to that area any time soon, and they still have them outside, then I might pick them up then. Or if I see them anywhere else in fact! I couldn’t get a close up picture of the food, I didn’t want to be rude and take a photo without buying anything. Next time, I won’t make the same mistake. No matter the circumstances, I’m going to try food like this! What seems like an age ago now, back at the end of September, a friend and I, Bettina, headed up to Osaka on a clear evening. Our first stop was the Osaka Sky Building, one of the tallest buildings in Osaka and one of my favourite places in the city. SO we hopped on the Keihan line and set off to the city. 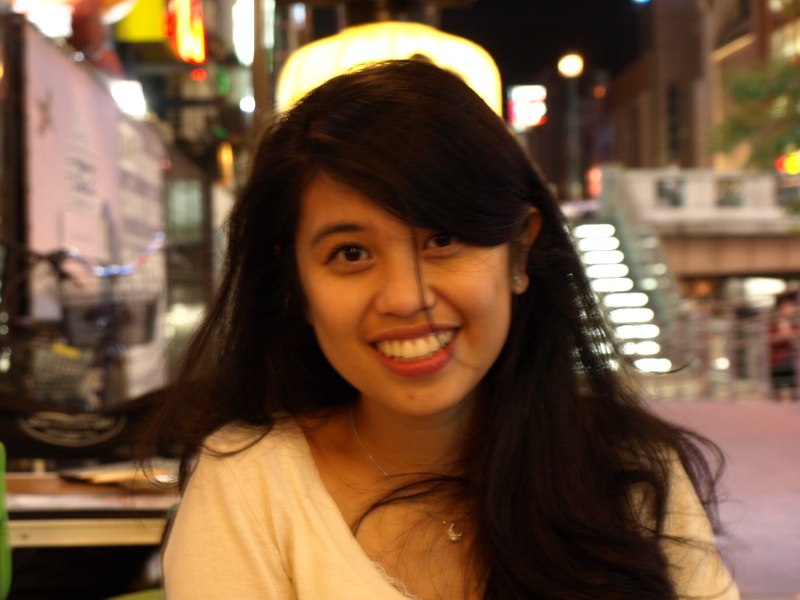 The lovely Bettina on the Dōtonbori Canal. 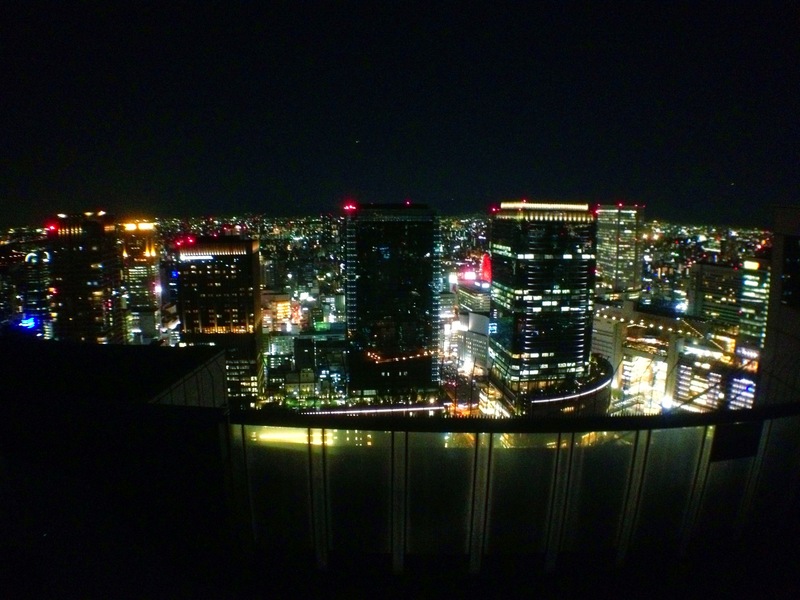 The Umeda Sky Building is one of my favourite tourist attractions in the Kansai reason. 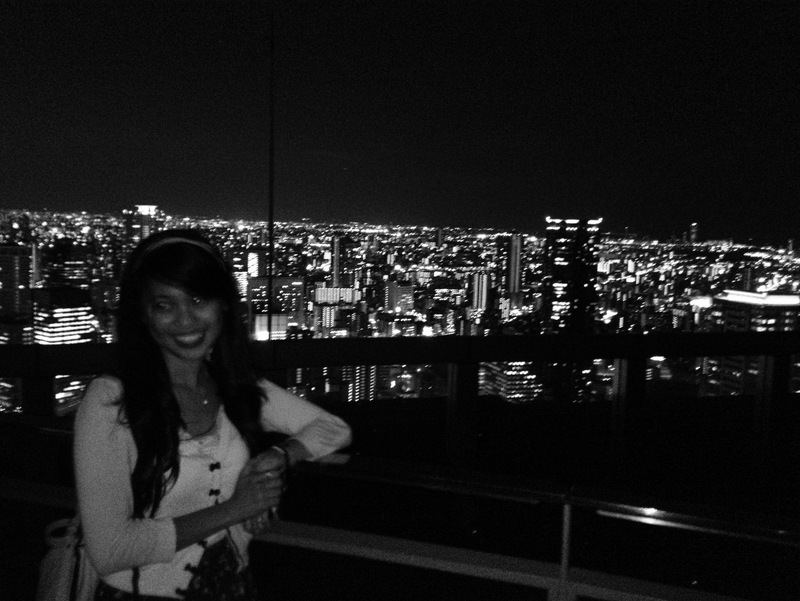 The views from the top are stunning. I had hoped to get their for sunset, but we left too late and it was already dark by the time we got there. Bettina hadn’t been there before and was getting ridiculously excited on the run up to getting there, and was took a huge amount of photos. The tower is 40 stories tall, with a ring-shaped viewing platform at the top called “The Floating Garden Observatory“. 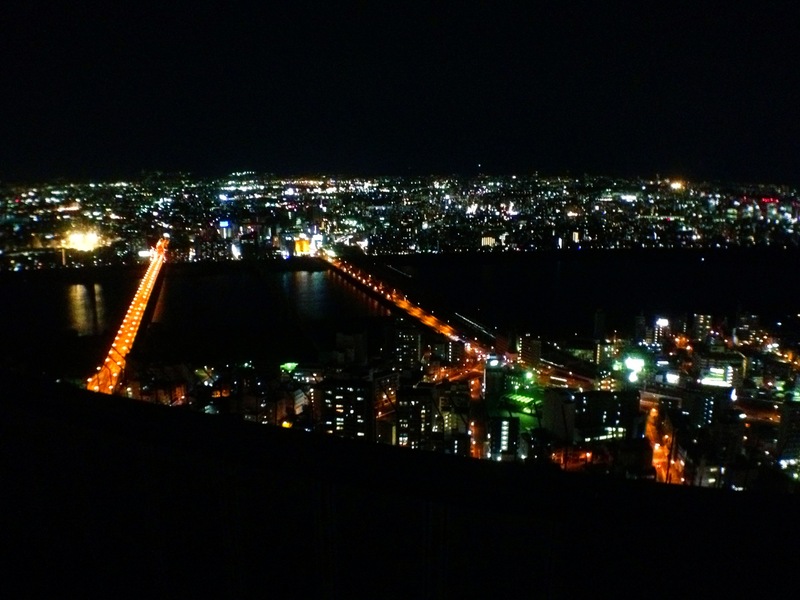 You can see a 360° view of Osaka and down the coast to the Inland Sea and Kobe. To go up the tower only costs ¥700. At the top is a cafe and lots of places to sit and enjoy the view. One thing I had forgotten about the first time I went to the building was how big a date spot it was. Every single person up there that night were a couple, and their were hearts everywhere. I guess I hadn’t noticed the first time, but it got fairly strange the second time. After a couple of hours at the top and a quick beer, we headed back down and made our way South to Dōtonbori, a central area of Osaka with many shops, restaurants and bars. It was getting on in the evening and we wanted something to eat. However I did get us slightly lost on the way. The thing with Japanese stations is that they are huge. Aside from the tracks and platforms, they often have dozens of exits, and are frequently linked to underground shopping centers and into above ground department stores. I managed to chose the wrong exit, and we ended up half a mile from where I though we would be. We chose a restaurant on the side of the canal, under the famous “Glico Man”, and ordered yakisoba (noodle dish with mixed meats) and okonomiyaki (a savioury pancake made with meat, cabbage and noodles, topped in special sauce in mayonnaise). 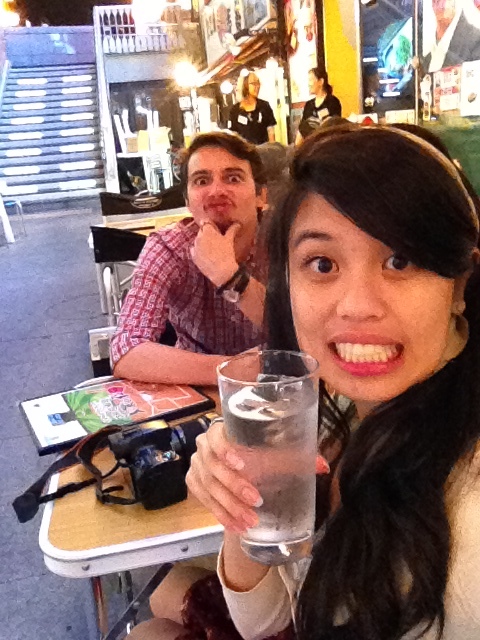 After finishing our meal, we had some time left, so I took Bettina to what is still my favourite bar in Osaka, DS CAFE. I’ve written before out that bar, and I still love it there. So we had a few drinks, met a random Filipino man, then had to dash for the last train home!